Tanganyika was administered by Britain from 1919 to 1946 as a League of Nations mandate, and then as a UN trusteeship territory until 1961, when it became independent, and a member of the Commonwealth. Three years later, Tanganyika, Zanzibar and Pemba combined to form the United Republic of Tanzania. 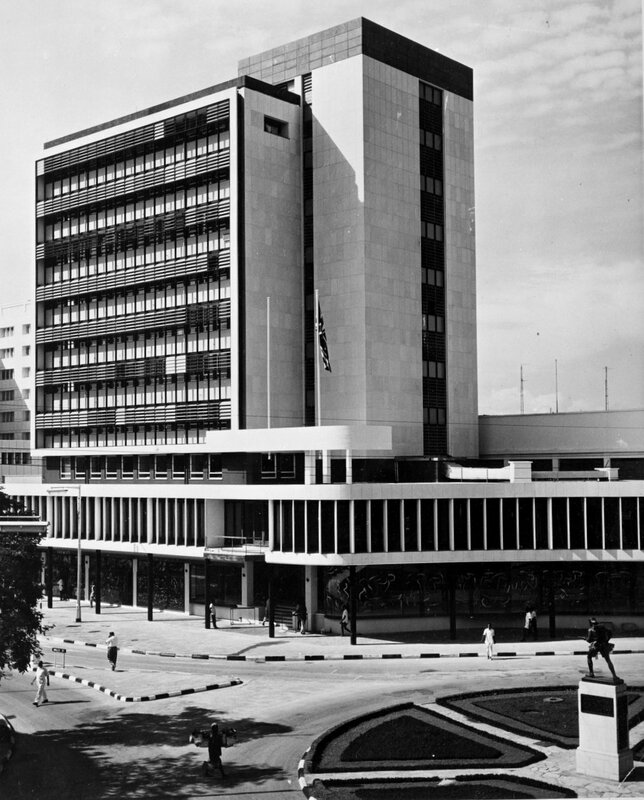 Dodoma was designated the national capital in 1974 but is not yet the seat of government. A house completed in 1951 at 1-2 Kenyatta Drive, formerly Kingsway, on a site of 0.65 hectare, was bought from Mrs V Antoniou for about £25,000 in 1961. 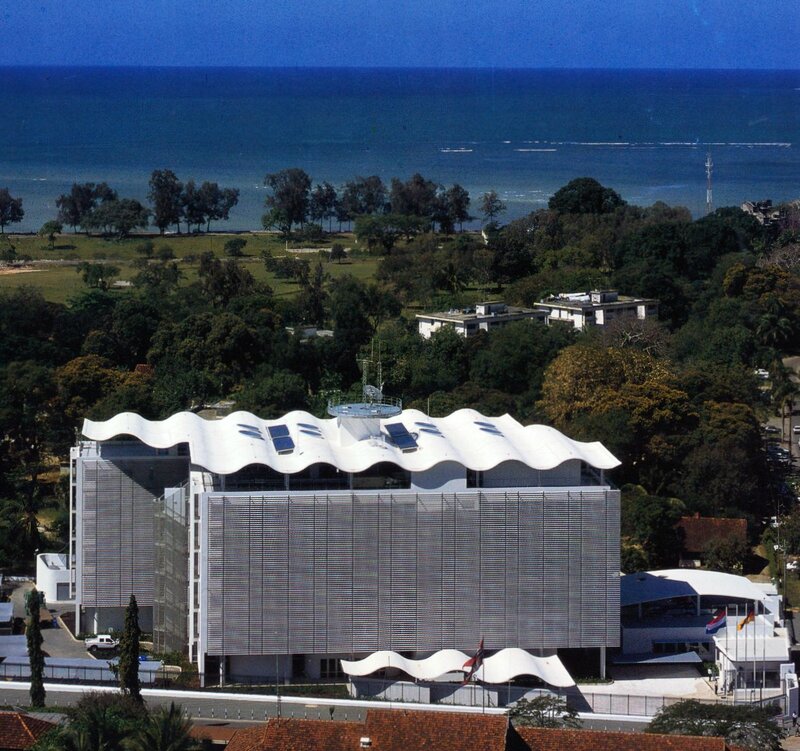 It had been designed for her husband, Ch Antoniou, by CA (‘Peter’) Bransgrove, the leading expatriate architect in Dar and an accomplished modernist. 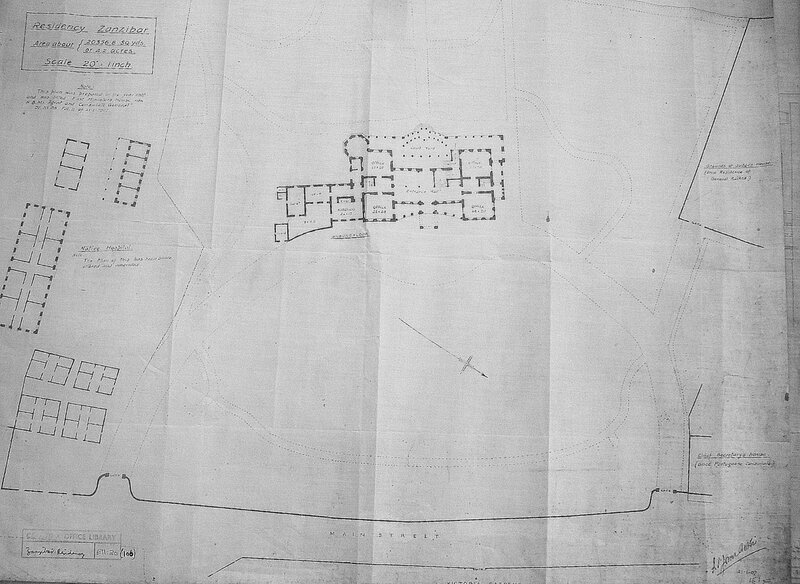 It was intended that the house should serve, albeit with considerable ingoings, as an interim residence until such time as a permanent residence could be built on a site yet to be found, and then revert to the deputy high commissioner. But the house performed better than expected as the residence, and the urgency of building another faded. Significant major repairs and improvements have been made over the years with the result that the house remains the residence. The pitched tile roof, added in the 1980s, may have increased the weatherproofing but detracted from the house’s modernist appearance. 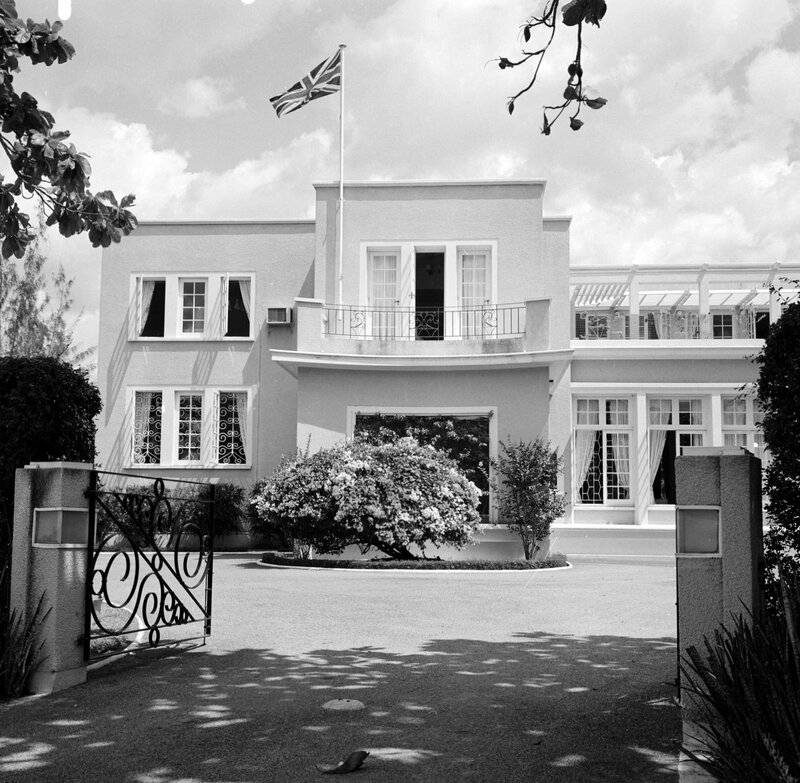 Nine houses, and four flats at 18 Ocean Road (also designed by Peter Bransgrove for KL Patel) were bought or long-leased in the early years of the high commission. 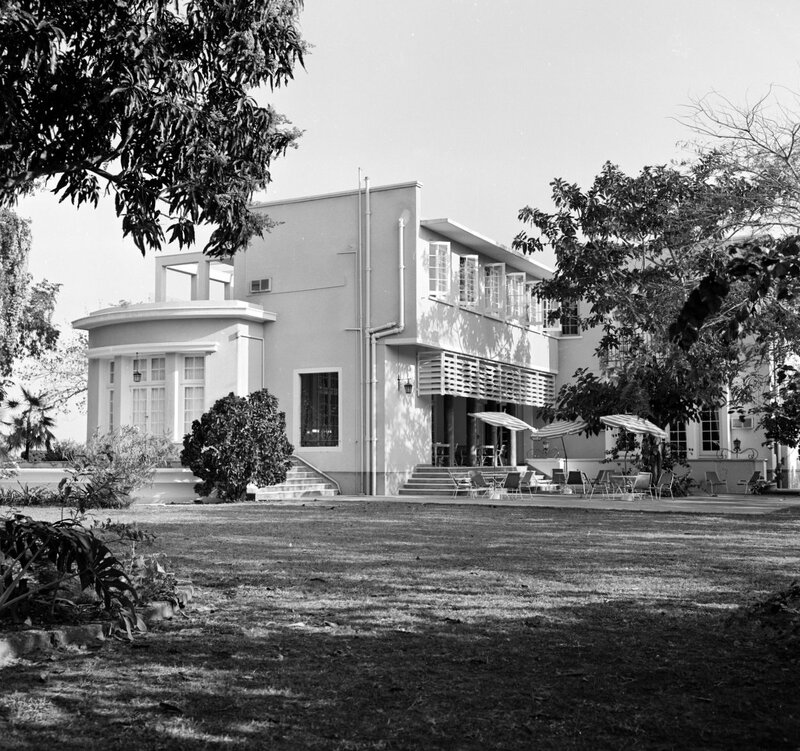 Main front of the residence, 1964. High commission offices were leased and occupied in 1961 on the upper five floors of the brand new, nine-storey First Permanent Building Society building. It was later called Hifadhi House, and stood on Acacia Avenue, later called Independence Avenue, and now Samora Avenue. 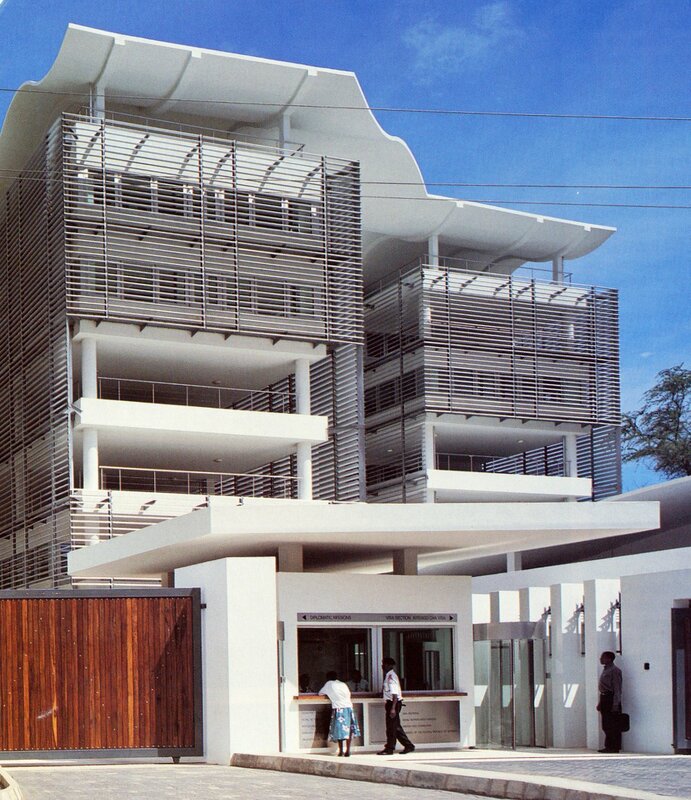 This building was also designed by CA Bransgrove + Partner and they supervised the high commission’s ingoing works. By the mid-1990s, Hifadhi House was becoming outmoded for the high commission’s purposes and the decision was taken to move when practicable. A site was accordingly acquired on the corner of Garden Avenue and Mirambo Street. The project offered opportunities for co-location with analogous partners: the eventual accommodation comprised space, besides for the British high commission and the Department for International Development, also for the embassies of Germany, the Netherlands, and the European Union. A design selection exercise in 1996 selected Michael Manser, of The Manser Practice, as the architect for the development. The 1998 bombings of the American embassies in Nairobi and Dar es Salaam had a poignant effect on the design and timescale for the new building (in addition to all the service engineering challenges of the climate). The building, called Umoja House, was opened in 2003, having cost (including the site) about £15 million. Umoja House, from the west, 2003. Umoja House, from the south, 2003. The island of Zanzibar was ruled by the Sultanate of Oman from 1698 until 1861 and, from 1832 until 1861, was the capital of the Sultanate, and the premier city of East Africa. Major Atkins Hamerton, recently appointed agent in Muscat of the East India Company, arrived in Zanzibar in 1841 and was appointed British consul. The Sultan made a property available to him at Ras Shangani, near the beach and the old Omani fort at the western tip of the town. Hamerton improved it as a consulate/agency building, and a subsequent consul bought it in 1867. This building became a springboard for British exploration into Africa until it was sold in 1890, for £4,000, after which it was for long occupied by the trading company Smith Mackenzie before becoming government offices in the 1970s. It still stands as a three-storey whitewashed building near the Tembo House Hotel, displaying a circular plaque recording that ‘… here at different times lived Speke, Burton, Grant and Kirk. David Livingstone stayed here & in this house his body rested on its long journey home’. 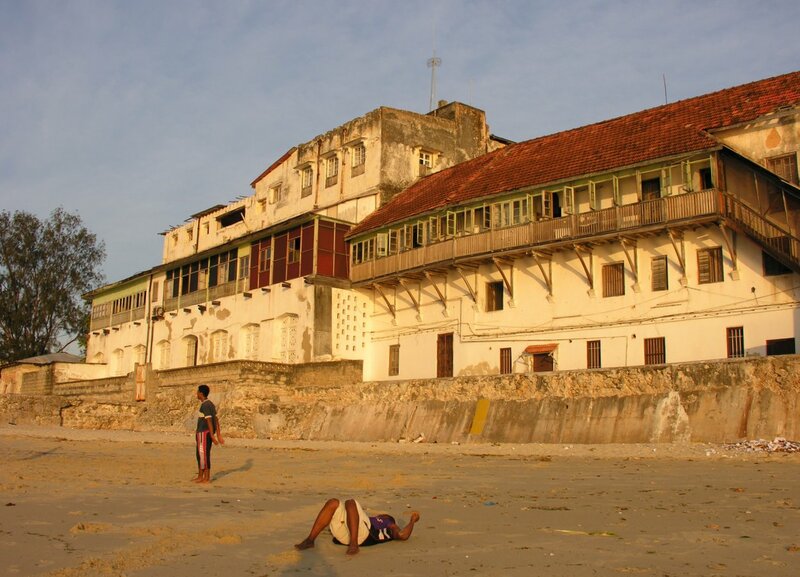 In 1874, the newly promoted consul-general, John Kirk, moved the mission into a nearby house on the beach called the Mambo Msiige – meaning ‘do not imitate’ – building, that had been built around 1850 by a wealthy Arab. In 1884, all the buildings were transferred from the Government of India to the Foreign Office and in 1889 to the Office of Works, and in 1890, Zanzibar became a British protectorate. 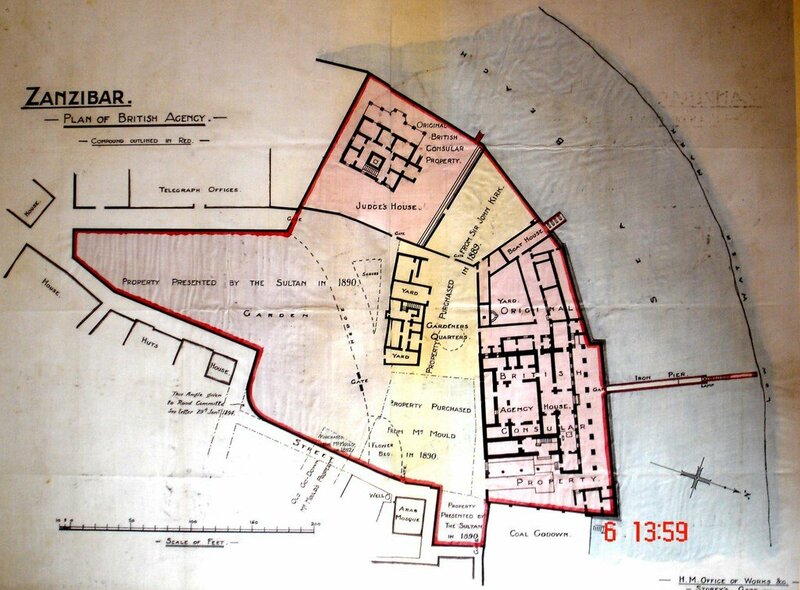 During 1889-92, various adjacent and interlocking properties were bought, or ‘presented’ by the Sultan, to create an enclave jutting into the Zanzibar Channel on the western-most tip of Stone Town. It contained the agency house, consulate, judge’s house and a large garden that had formerly been the site of Zanzibar’s main slave market. 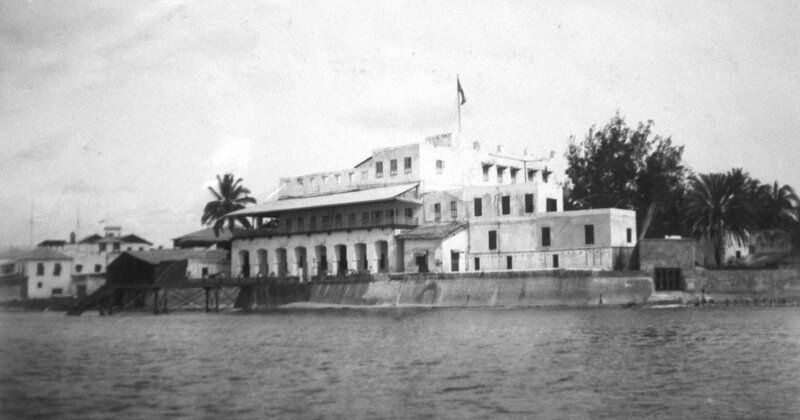 This enclave, in an exchange of 1907, was handed over to the Zanzibar government, and some of the buildings were later to be used as the European Hospital. Today, the former agency house contains government offices and the Zanzibar Shipping Corporation, and the judge’s house is part of the Serena Inn. The agency garden is now Kelele Square. In exchange for the enclave, the consulate gained a spacious new site in the south-west of the city, in an area which was becoming the superior residential and diplomatic district. On the site was a new and somewhat ungainly house, in the Saracenic style, built in 1903 by the Public Works Department for the purpose of this exchange. 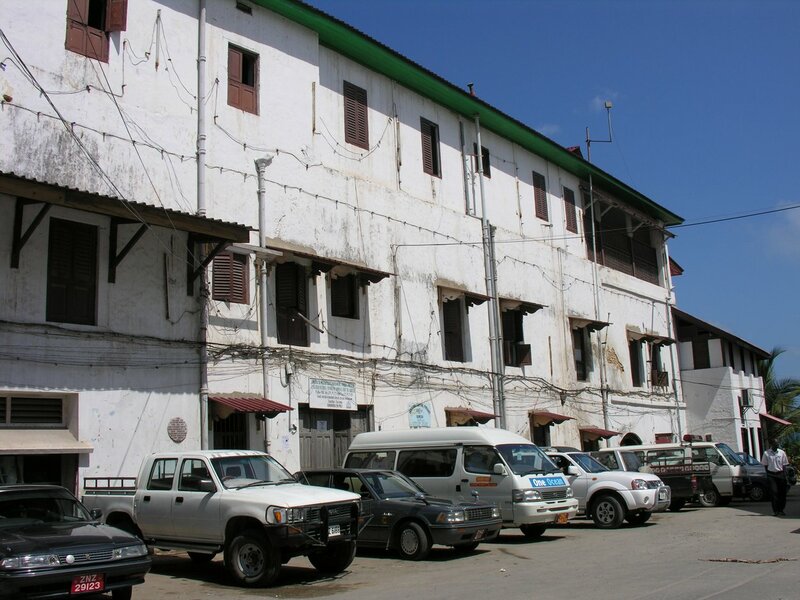 It was, apparently, designed by JH Sinclair CMG CBE who joined the Colonial Audit Branch in 1893 and served in Zanzibar successively as consul, chief secretary and British resident from 1899 to 1924: he was responsible for designing several other public buildings in the town. The consulate remained in this building until independence in 1963, when offices were leased in Assessment No 2278, Vuga. 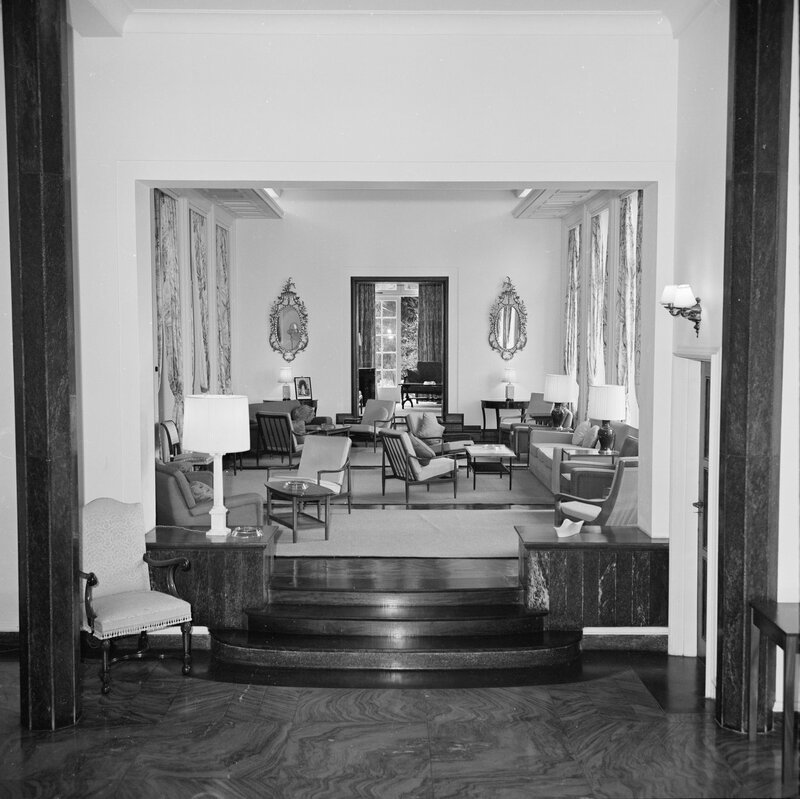 The Post never re-opened after diplomatic relations with Tanzania were broken in 1965. Long leases on two houses had been bought in the pre-independence period: on Plot No 2 Mazizini for 99 years in 1952, and on 42 Kelede Square for 15 years in 1964. 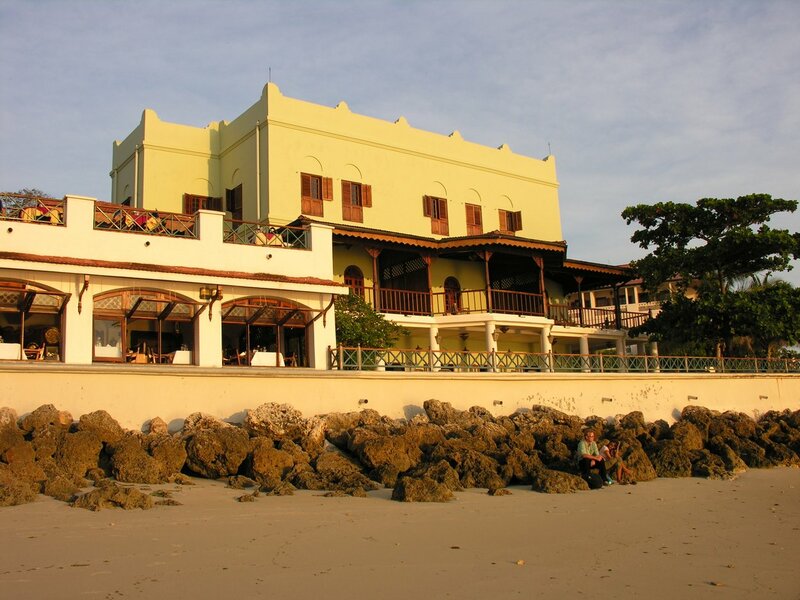 The former, once known as Tobacco House, later as Hamerton House, was used from the mid-1960s by high commission staff from Dar Es Salaam during duty visits to Zanzibar and for recreational purposes, and friendly missions were likewise permitted to use it. Hamerton House was disposed of in the 1980s. Extent of consulate/agency enclave, 1906. Second consular/agency building, c. 1905. Second consular/agency building, now government offices, 2007. Former Judge’s house, now part of Serena Hotel, 2007. 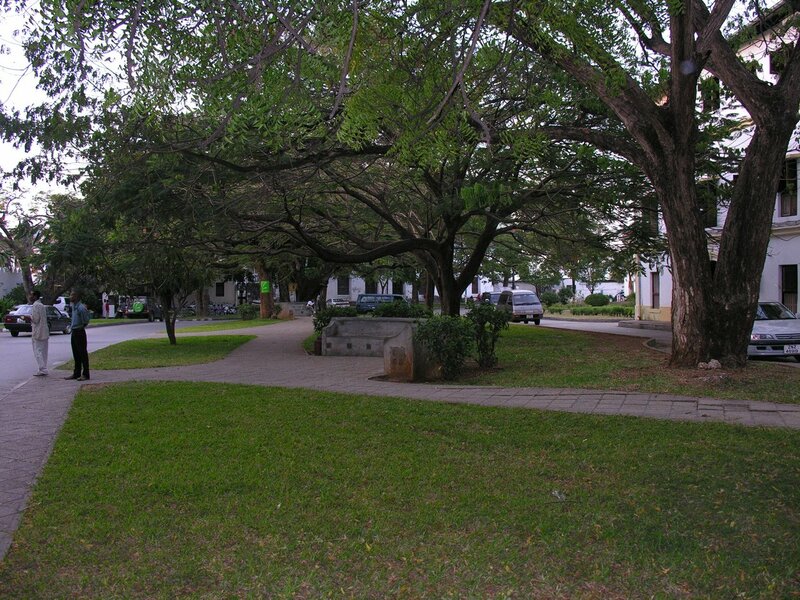 Site of original slave market, later consulate garden, now Kelele Square, 2007. 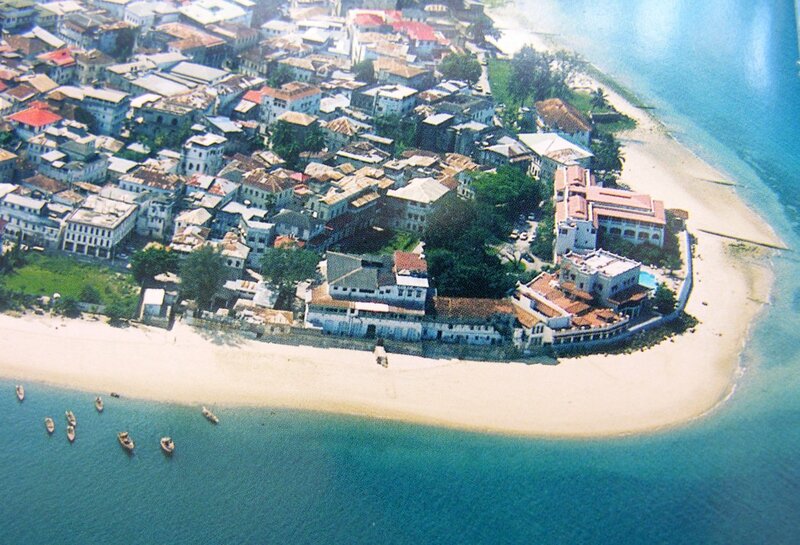 Aerial view of Stone Town, with former enclave near right and Kelele Square just behind, 2007. Location plan of third consulate, 1907. 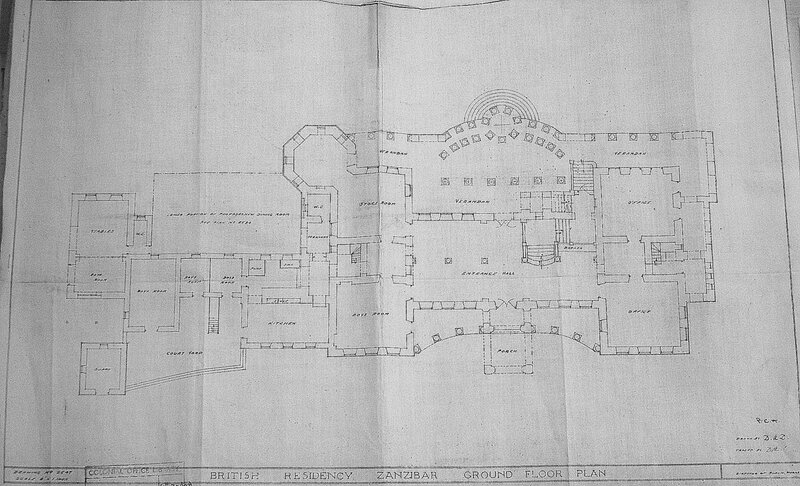 Ground floor plan of third consulate, 1907. 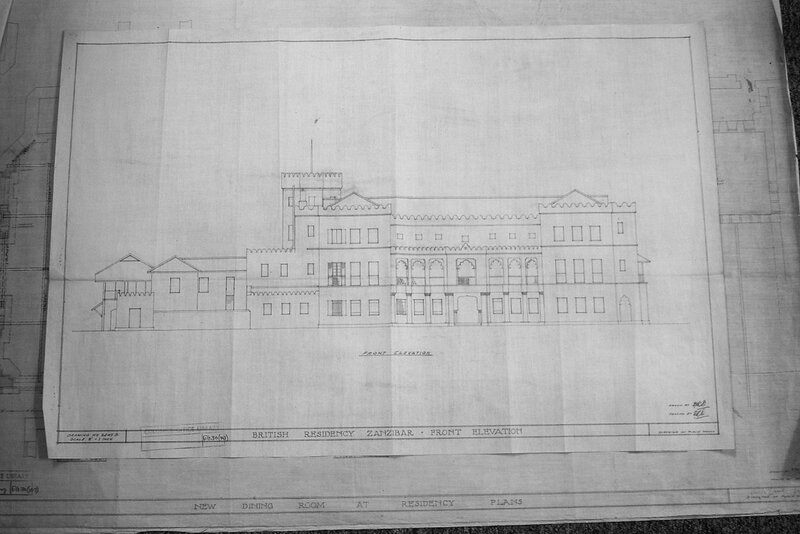 Front elevation drawing of third consulate, 1907.